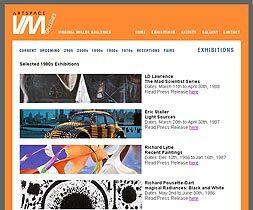 The gallery web site now features a number of its historic exhibitions held over the past 34 years. Clicking on a particular exhibition will bring up many of the works shown at that time as well as information about the show. Included is the one in 1978 for Alice Neel, the first exhibition of her 1927-1977 works on paper; the 1985 retrospective show of Richard Pousette-Dart, his first retrospective in the south; the 1984 exhibition of 136 of the most important works by the world’s master photographers; and other examples of the more than 300 exhibitions curated and presented to the public by Virginia Miller.